Porcelain veneers are long lasting, thin, porcelain shells that are bonded to the front of the teeth. Porcelain mimics the appearance of natural tooth enamel and structure unlike any other material. The result, when done by an expert cosmetic dentist, is a beautiful, natural looking smile. Frederick smiles dental care gives his patients a “Beautiful Smile Assurance”. This means you can rest assured your smile will be beautiful at the end of this process. This patient came to our dental office in Frederick, Maryland wanting to improve the appearance of her smile. She had two badly discolored front teeth. Our doctors used porcelain veneers to cover the discolored teeth for a highly aesthetic, virtually indistinguishable result. Porcelain veneers are an excellent solution for crooked or unevenly spaced teeth. They can also help with a variety of problems such as; severely discolored teeth, broken or excessively worn teeth, or teeth that are genetically deformed. Veneers can also cover dark fillings and actually strengthen and protect the tooth. A beautiful way to restore worn or chipped teeth, close spaces between teeth, and lengthen teeth. When you make the decision to have porcelain veneers, you need a dentist with artistic passion and skill. We also do a diagnostic wax-up, so you can preview of what your new smile will look like on the model. The next step is provisionals that you are able to try and “road test”. Once you are completely satisfied with the look, impressions are made of the provisionals. The impressions are sent to our expertly trained ceramists. 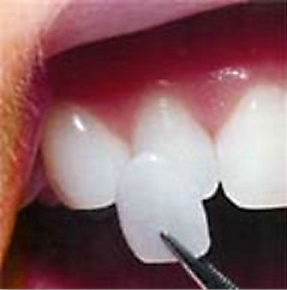 Any last adjustments are made to the finished veneers and then they are permanently bonded to your teeth.